Figure A71. Reggane anomaly, interpreted as the Reggane slab, with (horizontal) [vertical] cross sections through (A)[D] the UUP07 p-wave) and (B)[D] the combined SL2013 and S40RTS s-wave models at 1710 km; C) the location of the modern geological record that we interpret to have formed during the subduction of the slab. 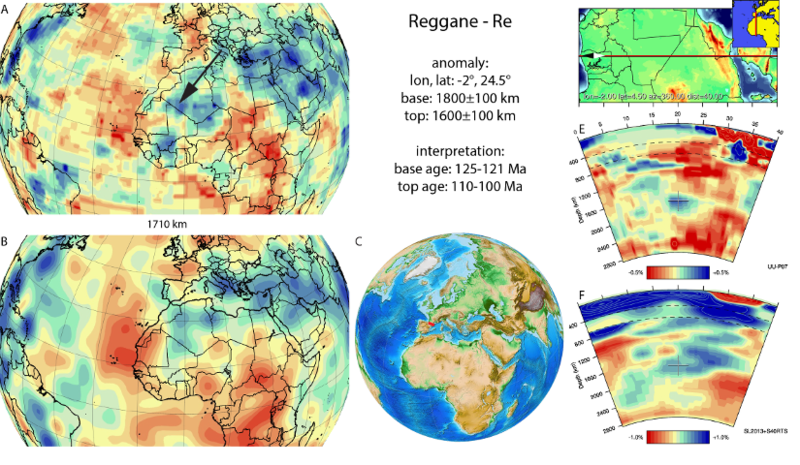 The Reggane anomaly (Figure A71) is a small anomaly located in the upper part of the lower mantle below the western Sahara in the lower mantle and is resolved in both the UUP07 and S40RTS models. It was previously identified by Vissers et al. (2015). The Algeria slab directly to the east, which we correlate with Early Cretaceous ophiolite emplacement over Adria suggests that the Reggane anomaly likely represents lithosphere that subducted sometime in the Late Jurassic or Early Cretaceous in the westernmost Mediterranean region. An Early Cretaceous phase of subduction between Iberia and southern France was postulated by Sibuet et al. (2004) based on reconstructions of the Bay of Biscay and Central Atlantic Ocean. Vissers and Meijer (2012a; b) revisited the ocean basin reconstructions and reconciled these with the shortening history of the Pyrenees. They confirmed that ocean basin reconstructions require ~500 km of Early Cretaceous convergence across the Pyrenees, preceding intra-continental shortening, and advocated a short phase of subduction accommodating the counterclockwise rotation of Iberia. Paleomagnetic data confirm the ~35-40° of counterclockwise rotation of Iberia relative to Eurasia predicted from ocean basin reconstructions and constrain the timing of rotation, and hence Pyrenean subduction, to ~125-110 Ma (Gong et al., 2008; Ruiz-Martinez et al., 2012). Vissers and Meijer (2012b) interpreted a phase of high-temperature metamorphism that affected the central Pyrenees around 110-100 Ma as the result of slab break-off. Vissers et al. (2016) therefore dated the base and top of the Reggane slab at 126-121 Ma, corresponding to the varying ages assigned to the M0 isochron, and 105±5 Ma, respectively. On the basis of refuting the paleomagnetic database of Vissers et al. and claiming the tomographic model used was inconclusive, Barnett-Moore et al. (2016) stated the Reggane slab was the result of enigmatic western Neotethys subduction instead of of Pyrenean subduction. Van Hinsbergen et al. (2017) showed that the Reggane anomaly appears in 8 tomographic models, including the ones used by Barnett-Moore et al. (2016), and showed that their criticism of Barnett-Moore et al. (2016) on the paleomagnetic database that requires Pyrenean subduction is unfounded. Impressive study that gives me a much more precise vision of what we are living on, a puzzle that moves constantly, although very slowly. Great job.